One of the questions we had hoped to answer before the publishing of this book was how the town of Aspinwall got its name. Although we received several likely suggestions, we never learned which -- if any -- was correct. In an interview with Lucille (Lamp) Boell shortly before his death in 1981, Orren Schroeder related the following story: "While standing approximately where Main Street is today, the early settlers could look north and view a mile-long stretch of aspen trees which extended westward from the Frank Meggers' farm. This view reflected a 'wall' of aspen trees thereby giving the pioneers the idea to call their new town Aspinwall." Ida Koester Wunder, who was born in 1902 and raised north of town, said she does not remember ever seeing a lot of trees along that road. However, early farmers often used young or small trees to make their fences, and sometimes the stumps would start to grow, producing a nearly straight line of trees. It is entirely possible that such a row of trees had begun to grow in 1882, but did not thrive and the stumps later dug out and a new fence put in. Another question remains: the aspen tree is not native to our area, although it closely resembles the cottonwood tree, which is commonly found in this region. Could our ancestors not only have identified the tree incorrectly, but misspelled it as well? Many of the towns which erupted from the prairie soil with the arrival of the railroad were named in honor of a railroad official or local people working closely with the railroad companies. Since Aspinwall was founded through the arrival of the Chicago, Milwaukee and St. Paul Railroad, it is possible the town was named for a person. Henry R. McMahon, Manilla, a former employee of the Milwaukee Railroad, told Dallas Lile that the dining cars on their trains were named for early Milwaukee Road officials. While working in Portage, Wisconsin and Stoughton, Wisconsin, Harry often saw an "Aspinwall" dining car. Harry also recalls his fellow employees speaking of a Mr. Aspinwall as an early top official in the Milwaukee Company or as a civil engineer who helped build the Canadian Pacific Railroad over the Rocky Mountains in 1882. While working on this book, Jean Voege, a nurse at Clarkson Hospital in Omaha, met a patient there by the name of Aspinwall. Mr. Aspinwall said that the Aspinwall name was common in the Madison, Wisconsin area, so Jean wrote a "Letter to the Editor" there asking whether anyone knew of a railroad worker or other person by that name who may have been working in western Iowa in 1882. She received the following reply from William H. Aspinwall of 886 Woodrow, Madison, Wisconsin: "I have no definite knowledge of who founded Aspinwall, Iowa, as my father came from England in 1896 and finally settled in Wisconsin. However, he had an uncle who came to the United States twenty years before him and was lost track of." "The American line goes back to 1651 when a William Aspinwall came as First Secretary of the Massachusetts Bay Colony. He went back to England but left a son, Peter, in this country which established the American line. The early Aspinwalls were ship builders and otherwise engaged in transportation. A William H. Aspinwall engineered the building of the Panama Railroad. Colon, Panama was originally named Aspinwall. The railroad was built between 1848 and 1855." At least four men with the Aspinwall surname have received a place of prominence in history, according to historical volumes such as Who Was Who In America." WILLIAM ASPINWALL, born June 4, 1743 in Brookline, Massachusetts, was a physician. He served as a volunteer in the Battle of Lexington in 1775 and was a brigade surgeon in the Continental Army. He later established an inoculation hospital for smallpox in Brookline where he practiced medicine until his death April 16, 823. Dr. Aspinwall was married to Susanna Gardner and his mother's maiden name was also Gardner. Ironically, the first doctor in Aspinwall was J.B. Gardner; his father was from Vermont. Dr. Gardner married Mary Offineer; her parents had bought a farm east of what was to become Aspinwall in 1880 and the Milwaukee Railroad obtained a right-of-way from Mr. Offineer to build its new line across his property. with England and the Mediterranean and also handled a large trade volume for the East and West Indies. When gold was discovered in California in 1849, Aspinwall resigned active leadership in the mercantile firm to enter the Pacific Railroad and Panama Steamship Company. Aspinwall headed the group which financed the building of the 40 miles of railroad across Panama and after the railroad opened in 1855, Aspinwall's firm controlled much of the shipping on the Atlantic and Pacific Oceans. In honor of their new railroad the settlement on the eastern end of the line was named Aspinwall. The town was later renamed Colon. Colon remained a small settlement until the construction of the Panama Canal in 1904 and today it is the second largest city in Panama with a population of 70,000. During the Civil War Mr. Aspinwall was an active supporter of President Lincoln's policies and also founded the Union League Club. Later, he held a place on innumerable boards of directors of railroads, banks and insurance companies. Mr. Aspinwall never held a political office but was active in other New York City activities. He was a leading member of the Chamber of Commerce, a trustee of the Lenox Library, a charter member of the Society for the Prevention of Cruelty to Animals, and owner of one of New York City's finest art galleries. Upon his death January 18, 1875, William H. Aspinwall was considered one of New York City's wealthiest citizens. SIR JOHN A.F. ASPINWALL, born in Liverpool, England, in 1851, became one of the greatest English railway engineers and managers. At the age of 24 he was appointed to the position of Works Manager at Inchicore in Dublin, Ireland, for the Great Southern and Western Railway. In 1883 he became Locomotive, Carriage and Wagon Superintendent of that railroad. Three years later Aspinwall was appointed Chief Mechanical Engineer of the Lanchire and Yorkshire Railway, a position he held for 33 years. Aspinwall planned and brought into service the locomotive works at Horwich and there he built excellent locomotives of the 4-4-0, 4-4-2 and 2-4-2 tank types. In 1899 he was promoted to General Manager of the firm, a rare distinct on for a locomotive engineer. He held this position for 20 years; he died in January, 1937. THOMAS ASPINWALL, born September 5, 1853 in Brookline, Massachusetts, was a civil engineer. Thomas graduated from the Massachusetts Institute of Technology in 1876 and later became a member of the Aspinwall and Lincoln consulting engineers. He was a member of the Massachusetts Volunteer Militia from 1878 until 1881. He later lived in Boston where he died March 2, 1918. Although many people in this area remember using an Aspinwall potato planter, which was pulled by horses, it apparently had no connection with our town. This planter was found in Defiance at their Centennial in June, 1982. 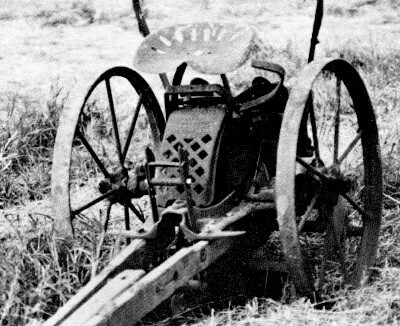 Many people in the Aspinwall area have used an Aspinwall potato planter, which was manufactured in Indiana. Amanda Koester Lamp remembers planting a number of acres of potatoes each year on their farm north of Aspinwall; the planter was pulled by two horses. At her father's farm sale in 1948, the planter was sold for $18 to Bert Miskimmons of Templeton. Iowa is not the only state that has a town called Aspinwall. Aspinwall, Pennsylvania is located near Pittsburgh and has a population of 3,550. Esther (Aspinwall) Johnson of Ironwood, Michigan, sent the following items of interest about the Aspinwall name: There is an Aspinwall Veterans Hospital in Camden, New Jersey. Years ago, a Sarah Aspinwall made headlines by riding horseback from coast to coast. The Aspinwalls may have been related to Robert E. Lee and to Eleanor Roosevelt. Members of the Aspinwall family usually have a slight build and brown eyes. And last, we had been told a story that a group of farmers gathered around the new townsite to decide upon a name. They came to agree upon an Indian name -- Aspinwall. While it was hard to visualize a chief, brave, or even a squaw by the name of Aspinwall, we were prepared to accept this theory and delve deeper into its roots. Shortly before the book was printed, the story's author returned somewhat sheepishly and admitted that it was just that: a story fabricated by his family to make a good tale for those ready to believe it.